Sometimes one just needs an interesting day, because otherwise life would go to smoothly. Bill does his workout at the gym right after I do. So when I finished and didn’t see him, I thought something was wrong. It was. He could not get the key out of the ignition. So I gave him my keys and took his car to get looked at. I had to leave the car there so called him to come get me when he was done, which he did. Then we went to lunch and home again where I desperately tried to get these pillowcases done. In the middle of this, we got the call, that they couldn’t get the key to stick, so come get the car and bring it in again when it sticks. Now when I got there with the car, they couldn’t get it out either, so apparently, waiting awhile, the key lost weight or ??? I did get one of the pillowcases done. The grandsons each have their own room and one was a bit disappointed that mom was not willing to spend the money for Seahawks sheets, blankets, etc. 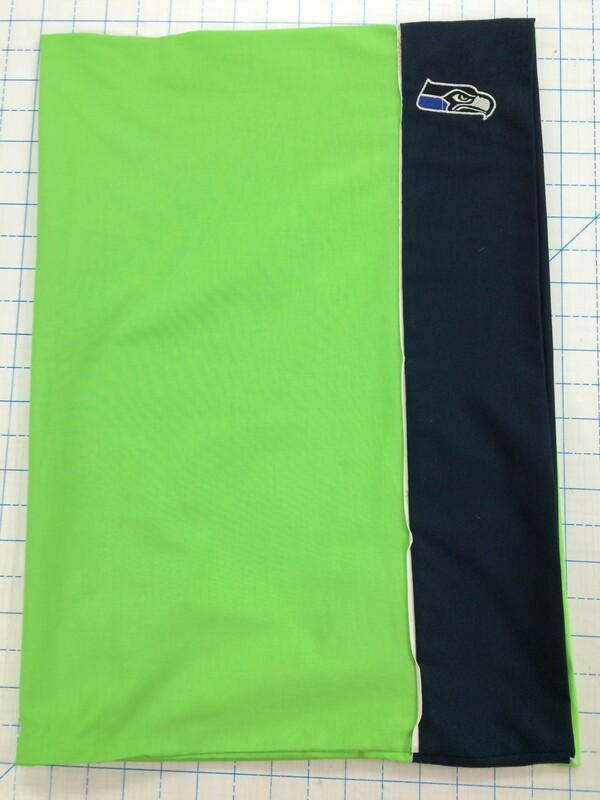 Since his birthday is just after Thanksgiving, I thought perhaps he would enjoy these Seahawk cases. I put the Hawk up high on the band so it wouldn’t irritate his face while he sleeps. Now to finish the other case, then wash, dry and wrap.